Contrary to popular belief in Europe and other parts of the world, the United States has existed longer as an independent country than most other countries in the world. There have been many historical epochs in the land now governed by the US, starting with the pre-colonial times when Native Americans held sway, the Colonial Era and the American Revolution. This article focuses on the antebellum history; from the first European settlement, until the American Civil War, which started in 1861, before most of the Industrial Revolution, large-scale railroad expansion, and the American colonization of the Old West. 1583 — Newfoundland, now part of Canada, becomes the first British colony in North America. The founder dies during the voyage back to England and his brother, Sir Walter Raleigh, takes over. 1664 – New Netherland was conquered by Britain, with both the colony and the city of New Amsterdam re-named New York after the Duke of York. 1775-1783 – American Revolutionary War - the US gains independence; also known as the "War of Independence"
1830 – The first scheduled passenger rail service departs Charleston (South Carolina) on 6 mi (9.7 km) of track under steam power; by 1869, a Last Spike will join East and West. 1837 – The Panic of 1837 starts an economic depression which continues until 1843. 1850 – A nascent Underground Railroad proposes Canada as the promised land, after the 1850 Fugitive Slave Act enables abduction and capture of runaway slaves - and in some cases even unlucky free blacks who couldn't prove their freedom - nationwide. 41.95833-70.667781 Plymouth, Massachusetts. The place where the Puritan "Pilgrims" landed in 1620, and the site of the original Thanksgiving holiday. The oldest surviving colony in New England. 42.51944-70.896672 Salem, Massachusetts. Among other things, known for the Salem Witch Trials. 42.359-71.0563 Boston, Massachusetts. Much of the prelude to the War of Independence happened here, such as the Boston Tea Party and the Boston Massacre. The Freedom Trail will be of particular interest to Revolutionary War buffs. 42.460278-71.3494444 Concord (Massachusetts). One of the first battlefields of the War of Independence has been commemorated with the Minute Man National Historical Park. 42.61583-70.661945 Gloucester (Massachusetts). The oldest seaport in the United States. 40.719-74.0026 New York, New York. Originally a Dutch colony, named Nieuw Amsterdam. 40.91667-74.171947 Paterson, New Jersey. "The Silk City" was the nation's first planned industrial city. 39.95383-75.162458 Philadelphia, Pennsylvania. Once the capital of the Union, and where the Declaration of Independence was drafted and signed. 39.29219-76.609559 Baltimore, Maryland. During the War of 1812, Baltimore resisted a British attack. The battle was inspiration for The Star-Spangled Banner, the American National Anthem. 38.9767-76.48993410 Annapolis, Maryland. A colonial port city with many preserved buildings. 40.454167-78.54027812 Allegheny Portage Railroad, Pennsylvania (near Altoona). A railroad, operating 1834 to 1854, which became an early gateway between the Atlantic and the Midwest. Contains the first American railroad tunnel. 37.03-76.3452814 Hampton, Virginia. The Fort Monroe National Monument. 32.08097-81.0907716 Savannah, Georgia. Founded in 1733. Captured by the British during the Revolutionary War. 29.89461-81.3143617 St. Augustine, Florida. The oldest surviving European settlement in the United States. 29.425556-98.48611119 The Alamo, San Antonio, Texas (off map). Considered to be hallowed ground and the Shrine of Texas Liberty, the Alamo is a former mission which was also the site of the Battle of the Alamo (1836). Admission is free, although donations are appreciated. Revenues from an adjacent gift shop fund the historic preservation efforts. Black Heritage Trail — This trail covers ten sites important in American black history scattered throughout Boston's Beacon Hill neighborhood. The Freedom Trail — A major tourist draw of significant historical sites in Boston. These 17 locations spread over 2.5 mi (4.0 km) are crucial to understanding revolutionary era America. American Industry Tour begins with the antebellum industries of the Northeast. 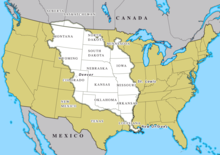 This travel topic about Early United States history is an outline and needs more content. It has a template, but there is not enough information present. Please plunge forward and help it grow! This travel guide page was last edited at 03:21, on 22 January 2019 by Wikivoyage user Yvwv. Based on work by Wikivoyage users Traveler100bot, SelfieCity, ButteBag, Mx. Granger, The dog2, Pashley, Hobbitschuster, K7L and Andrewssi2 and others.